I got back to Barrow to find snow on the ground. 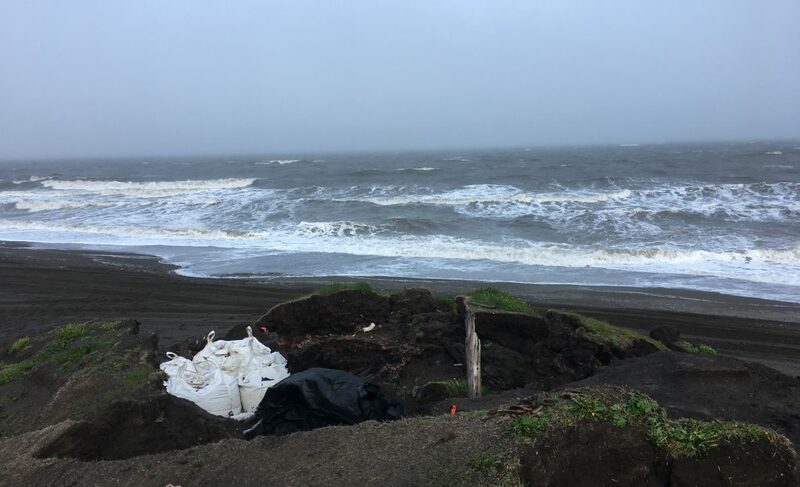 It hasn’t been that stormy here, but we had a coastal flood warning over the weekend, with part of the road to Nuvuk getting washed out, and waves getting over many of the berms. I am afraid that there may have been significant damage to the site beyond the 20 m we already lost in September. I would like to get out and take a look, maybe even shoot in the bluff, before I go to Valdez & Seattle, but that is not looking too likely. Apparently, there is a likelihood of a storm surge from the Chukchi and flooding over the next few days, maybe until the 22nd or so. The North Slope Borough is quite worried, and sending out info on emergency kits & so forth. Not a great situation. The house I live in floated in the last really big storm surge event in 1963, and if it does it again, it could wind up in the NARL sewage lagoon. Yuck. We’ll be prepared, but I don’t think it is that likely to get that bad. However, it most certainly is already damaging Nuvuk more. It has been blowing from the north and winds are picking up. It is a bit depressing given that erosion must nearly have reached the GPR returns that we think are Ipiutak features. Not much to be done about it, so I just push on with writing proposals & papers. I’m going to a workshop on the Kurils & Aleutians, and am slightly belated working on the conference paper. Just as I got ready to really check out the other papers prior to doing the serious writing (the outline is done), it was discovered the website had lost the last 3 weeks of updates (explains where my stuff went–I thought they were just being slow getting it up), so I couldn’t get into it. I hope we don’t lose Internet later this week, and that I have decent connectivity in Valdez. Posted on October 16, 2012 by Anne JensenPosted in Archaeology, Barrow, Conferences, IpiutakTagged Archaeology, Barrow, erosion, Ipiutak, Nuvuk, ocean, weather.